Lake LBJ is a perfect place to spend the weekend fishing and enjoying the night in some great fishing cabins on Lake LBJ. 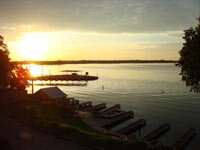 In addition to fishing, there are lots of other fun things to see and do near the following Lake LBJ fishing lodging. To learn more, check out the resource guide below and the Lake LBJ map which has things to see and do on or near the lake. Gather your fishing buddies or family and spend a weekend or longer in this 2200 square foot 3 bedroom, 2.5 bath home that sits on a full acre ON THE LAKE! 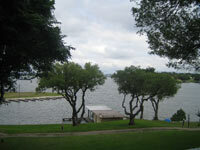 The property is located in Sunrise Beach on prime open water and has 600 feet of waterfront on beautiful Lake LBJ. And the fishing is terrific from a private dock. Bring your boat and launch it from the boat ramp on the property and your rental includes use of a private covered boat slip with a lift. Adjacent to the property is a gas dock and convenience store, complete with bait. The home has a lake cottage feel with new tile and hand scraped hardwood floors. There are beds for 13 of your fishing buddies, family, or friends and there is additional space for sleeping bags or inflatable beds if you care to bring them. The master bath has recently been completely re-modeled, including a jetted tub, and tile surround shower. The kitchen has substantial cabinet storage, and all the cooking and serving pieces you need to feed a large group. And the two very large decks provide a spectacular view of the Texas Hill Country sunrise and they are perfect for a cocktail and reminiscing about the big ones you'll catch tomorrow! Sunrise Beach is conveniently located to lots of fun things to see and do both on and off the lake. The property is just a few miles from Horseshoe Bay and the Colorado River or Llano River arms of the Lake and within two minutes by boat you can be at Lake LBJ's infamous party cove. Within 10 miles you can be golfing on a fun nine hole course or one of three other good 18 hole courses. There is also Caverns to explore, great rock climbing at Enchanted Rock, or deer hunting in Llano Country which is known as the deer hunting capital of the world! Very close to Sunrise Beach you have 3 fun courses The Legends on Lake LBJ, Packsaddle Country Club & Blue Lake Golf Club, a fun 9 hole course - plus you have lots of other good nearby courses as shown on the map.